Photo by Marcel Schoenhardt / CC BY-SA 2.0. Taken November 11, 2010. Spring is here at last! The season of rebirth, renewal, and… demolition? Yes. It seems that, here in Edmonton, spring has not truly arrived unless we’re talking about tearing down one of our iconic and historic buildings. It’s a sort of perverse spring cleaning ritual for this city. The latest potential victim: the Paramount Theatre on Jasper Avenue. While news of the building’s possible demolition (along with the eviction of current tenants The Hat, Three Amigos, and Remedy Café, among others) came as a shock to many, the truth is that rumours have been swirling around about the Paramount’s impending doom since at least 2007. In its place, the Paramount’s owner, ProCura, proposes to develop a highrise residential tower. I’ll leave the architectural qualities of the proposed tower, as well as other local projects by ProCura, for others to comment on. However, it is interesting to note that in a recent Globe & Mail article, ProCura President and CEO George Schluessel had this to say about Edmonton: “You never go broke owning a parking lot in this town.” Inspiring. The mid-20th century expansion of Famous Players across Canada was the impetus for what came to be the Paramount Theatre. Local architectural firm Stanley and Stanley was recruited for the $500,000 project and the theatre officially opened on July 1, 1952. 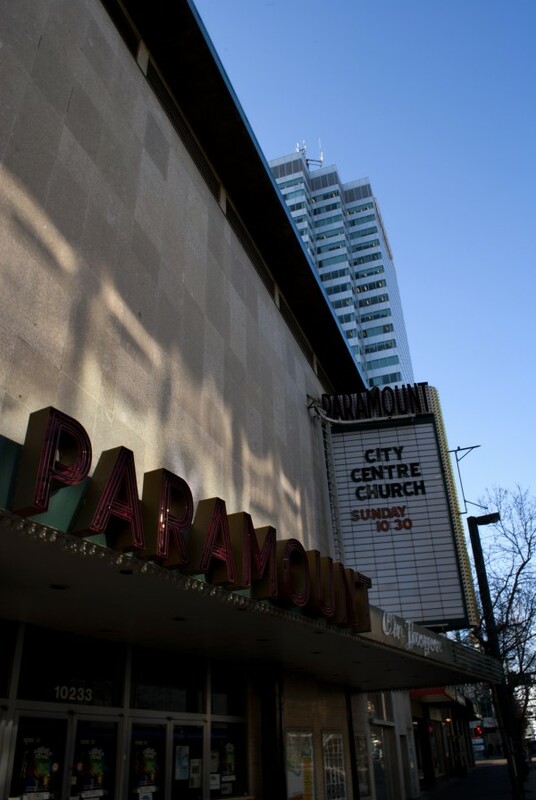 The Paramount is considered an excellent example of the International Style and is notable for the use of luxurious building materials in its construction, including travertine and black marble from Italy and Tyndall stone from Manitoba. 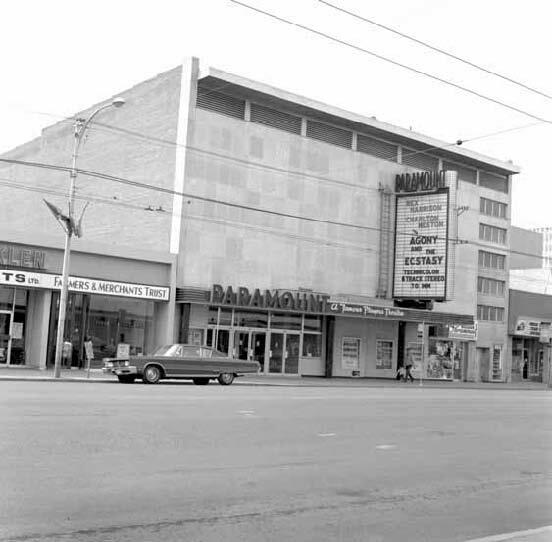 As time wore on, the theatre struggled to compete with newer and larger multiplexes, even as Edmonton’s downtown population grew in the early 21st century. In theory, the critical mass of residents that ProCura’s new tower promises to bring should serve to enliven the downtown and it certainly can’t hurt. However, attracting people to live downtown takes more than simply giving them a place to live. It is equally important to give them reasons to want to live there. Part of this equation, in addition to providing places to work and play, includes maintaining and repurposing iconic and historic buildings to which people have attached memories. This is Placemaking 101. Edmonton’s continued obsession with renewal is a threat to building an appealing and cohesive city image – key to attracting new residents and building a sense of pride among current ones. Image of place often develops through memory of place. Edmonton’s downtown and Jasper Avenue have historically experienced such upheaval that it is unsurprising that they are often absent in descriptions of the city. The memories have scarcely had time to stick. And those that have are often the next target for the wrecking ball. Ask yourself, what is Edmonton known for? If you answered West Edmonton Mall, potholes, or the 1980s Oilers Stanley Cup dynasty, you’re proving my point. These are hardly the things that build up new civic pride or attract outsiders to live in our city. By tearing down our past in annual acts of renewal, we’ve developed a sort of collective amnesia that is hurting our ability to form a collective identity. The act of spring cleaning offers an important opportunity to sort through the clutter and to rediscover treasures from days gone by. Like a springtime ritual, Edmonton is cleaning house. In the balance is another iconic and historic building. This begs the question, is the Paramount Theatre part of our urban clutter or a treasured piece of our urban landscape?